Australian winger Digby Ioane has been ruled out of Saturday’s game through injury, and could miss the remainder of the tournament. Buckley is flattened by the combined powers of Hayden Smith and Phil Thiel. DECLAN KIDNEY AND the Irish rugby squad landed in Auckland this morning with just one injury concern ahead of Saturday’s make-or-break meeting with Australia. Tony Buckley, who came on to replace Tom Court for the final 16 minutes of yesterday’s 22-10 victory over America, will have an MRI scan today before a decision is taken on his fitness. The remainder of the squad have all been given a clean bill of health, which means that Cian Healy, Sean O’Brien and Rob Kearney could all make their World Cup debuts against the Wallabies. One man who definitely won’t feature on Saturday is Australian winger Digby Ioane. The Queensland Reds star, who scored one of four tries yesterday as Australia beat Italy 32-6, will need surgery on a fractured right thumb and could be in danger of missing the remainder of the tournament. “Ioane will be operated on and will remain with the Wallabies in New Zealand,” said a team statement. He is expected to be available to play again later in the tournament although the exact timelines on when he might be able to return will not be known until after the joint has been operated on, and his rehabilitation from the injury has begun. Poll: How do you feel about Ireland’s prospects now? Email “Buckley the only doubt as Ireland head to Auckland”. 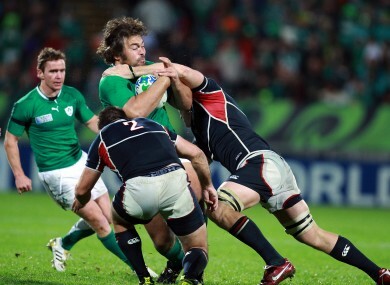 Feedback on “Buckley the only doubt as Ireland head to Auckland”.